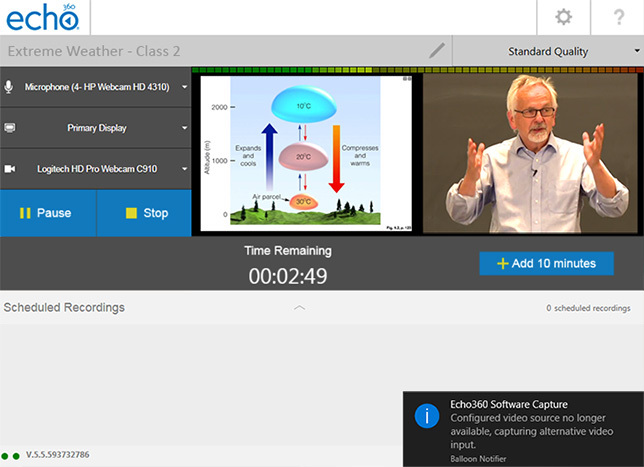 Echo360 today rolled out new capabilities for its lecture capture software that use algorithms to anticipate, identify and correct recording issues on the spot. The system can automatically account for shifting inputs and resolutions, resize video, resume recording after an unexpected interruption and more. "Since we know capture problems occur in real-life instructional environments such as system reboots, instructors forgetting to end a capture, or faculty switching from a camera to a smartboard on the fly, we want to protect the instructional moments algorithmically," explained Echo260 CTO Bradley Fordham in a statement. "The new features are designed to counteract inevitable challenges and issues, and adapt in real-time to create a more seamless and reliable way to capture teaching and learning." Capture duration setting: Instructors no longer need to remember to end the capture process before leaving the classroom. They can now configure the duration of the class when they start a capture and it is automatically ended and published when class is over. For more information, visit the Echo360 blog.